16 hours laboratory to create projects, open to artists from all different disciplines: dance, film, video, visual art, writing, music. Aim: meet, debate, exchange, create, collaboration between artists from different disciplines who are engaged to explore the art of dance in the context of film and video art. On July 5th participants will edit their resulting films. On July 6th there will be a screening of the Laboratory Films. 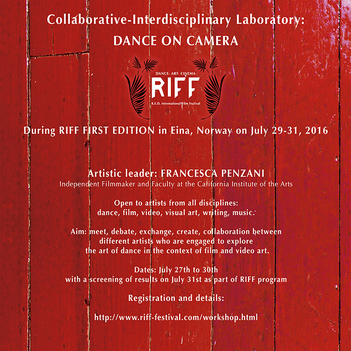 Open to artists from all different disciplines: dance, film, video, visual art, writing, music. Aim: meet, debate, exchange and create, a collaboration between artists from different artists who are engaged to explore the art of dance in the context of film and video art. - Investigate different approaches to making dance film: structured, improvised and collaboration. - Planning for final collaborative projects. -Whole assistance by the workshop leader through critical feedback. - Starting points for concepts: Private/Public Spaces, Poetry, Fragmentation, Translation, Sounds, Parallel Lives, Memories, Portraits of People and/or Spaces, Narrative/Abstraction, Messages, Mistery/Magic, Past and Present. - SCREENING OF RESULTS ON JULY 31st AS PART OF RIFF PROGRAM. Personal Video Camera, Laptop/Editing Equipment, previous experience on screendance or video or film. Having professional art experience is better, but not imperative. Nyland Gård, Einavegen 1769-1771, 2843 Eina. Phone: +47- 91 56 34 24. The farm is located approx 10 minutes south of Eina Center and train station. It is a farm over looking Eina Lake, 1 hour and 20 minutes outside Oslo, Norway.